The menubar contains all commands grouped by menus. The menubar changes depending on the chosen accounting type. The toolbar contains icons that allow you to access the most used commands and dialogs. If you go over the icon with your mouse a command description will be displayed. Text are entered directly in the cell. The entered text is also shown in the text input area, right below the toolbar. You can always view the short-cut keys list from the Help menu - Keyboard shortcuts command. The program will suggest some choices (similar transactions, accounts or VAT codes) based on the entered text. You must scroll with the arrow down key and select the appropriate choice. Elements containing the entered text anywhere. 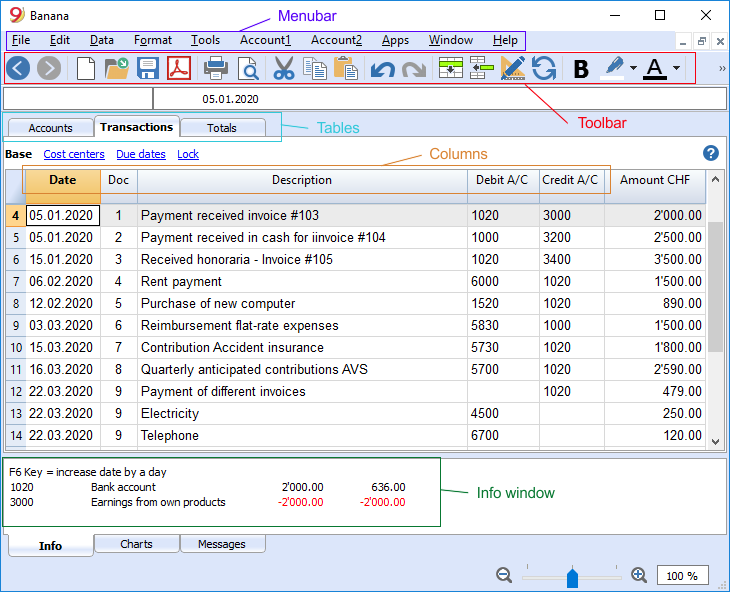 For example the account 1000 cash can be will be shown by the program as soon as you type 10 or just "cash"
Some columns are associated with certain actions that can be executed with the Execute command (from the Edit menu) or relative touch key, as indicated in the information window. Each accounting file has various tables. Some of them are main tables and others are optional. Tables vary depending on the chosen accounting type. 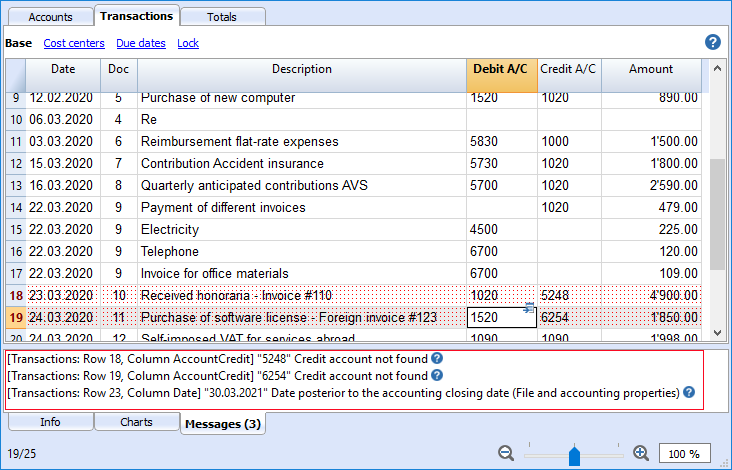 The views are ways of showing the accounting data with specific columns. For each table there are different views and they are very useful when you want to show your data in different ways, without altering your basic settings. Views are located right below the tables and can be personalized using the Tables setup command from the Data menu. You can also create new ones. Columns are the table vertical elements. Each table has specific columns with specific heathers. The display, size, description, format, width, style, alignment can be edited thorough the Columns setup command from the Data menu. 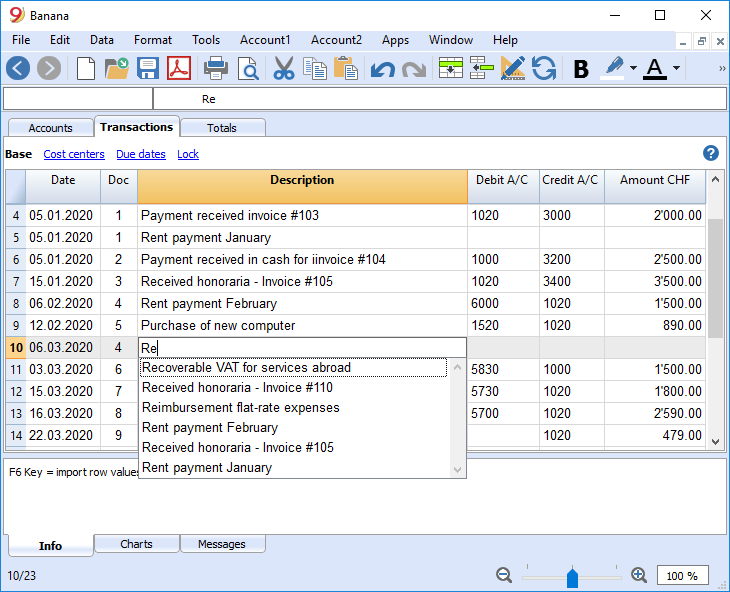 Some columns contain data entered by the user, and some others can only be used by the program and cannot be edited by the user (for example the account cards columns). Users can add new columns in order to include additional information (always with the Columns setup command from the Data menu), but the data entered will not be processed by the program. A group of specific columns composes a view that displays only specific data. This is a window located in the lower part of the screen, where the program displays useful information related to the active table and cell. Error messages are shown in red. When an error occurs, the program displays the error in the Message window, indicating in which row of which table the error is located. It also shows a description of the error. By clicking on the Help button you will be addressed of the online page where the error is explained, along with possible solutions. All error messages reported by the program are saved in the Error Message window. The Messages windows contains a list of the errors found by the program. In order to read the messages click on the Messages tab. From the Messages window, by double clicking on the error message, you will be taken to the row that generated the error. 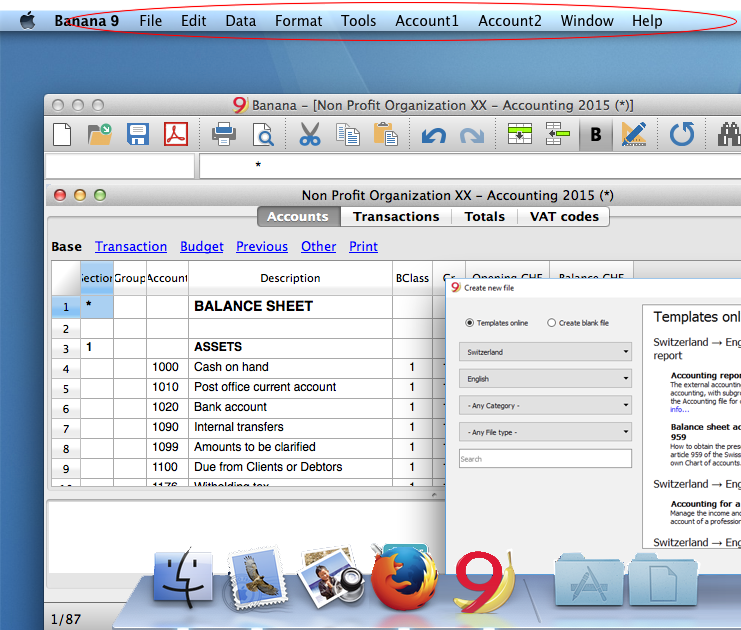 From version 9.0.4 of Banana Accounting 9, a help button has also been introduced in each table, on the top-right corner. By clicking on the help button you will be automatically addressed to our online documentation page where that specific table is described. 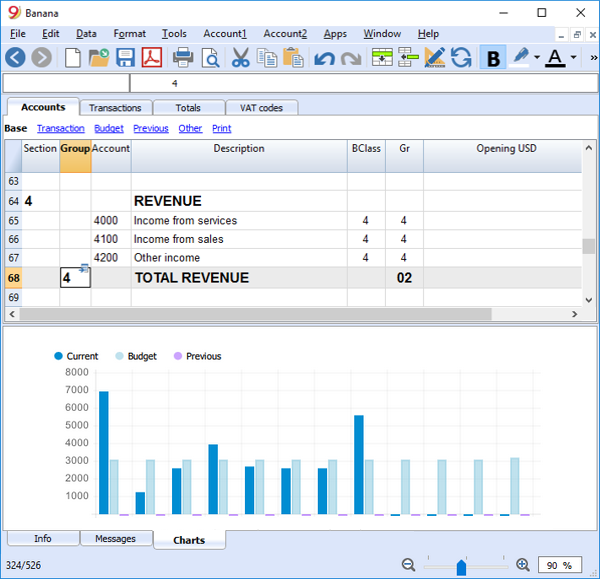 Graphs are integrated in the program: you can now generate graphs directly in Banana accounting. By selecting an account or group, it is possible to display a chart in the charts window at the bottom. The graph will allow you to instantly visualise the evolution of your situation, and even allow a comparison between your forecast and your actual figures. Once the program is installed, it automatically uses as default your operating system settings. If you wish to change your operating system settings, you should go in your Control Panel (Windows) or your System Preferences (Mac). in order to change your numbers or currency format, from the same window you can click on the Additional settings button and then on the Numbers or currency tab.